Do you have a large tree or trees in your Bethel, MN yard or business that need to be removed or pruned? Believe it or not, the big Spring storms will be visiting Minnesota soon - don't wait to get these potential hazards of damaged overhanging tree limbs removed. Pioneer Tree Service provides tree services following the American National Standards Institute standard for tree pruning. 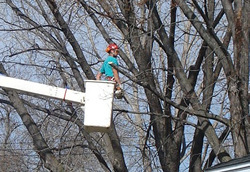 Pioneer Tree Service provides tree pruning & tree removal services.